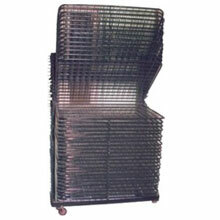 We manufacture a wide range of Paper Drying Racks in different sizes. Normal Sizes in Paper Drying Racks are i.e. 20" x 30" and 30" x 40". Our product range is fabricated using optimum quality raw material under the supervision of our experienced professionals. These machines are designed as per the industrial standards and can also be customized as per the specific requirements of our esteemed clients. Offered racks are widely acknowledged for less maintenance and long lasting nature.